Enjoy a romantic cruise along the river Seine. Discover an elegant river Seine with it's beautiful banks and unique perspectives of the twinkling lights of Paris. While admiring famous monuments of Paris and the fascinating French scenery, treat your self with delicious French food and fine wine. The Seine is France's best-known river flowing through Paris into the English Channel. The River Seine tour is a truly unforgettable experience. 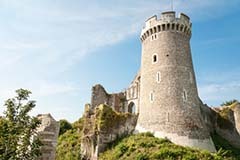 You will be sailing through the historic heat of the Normandy, the magnificent and beautiful French countryside landscapes and discover many memorable sites with some excursions include in your River Cruise holiday along the Seine. 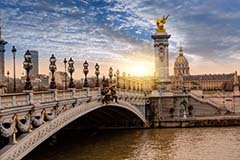 Whether you are travelling as a couple, a family or on your own, we at Coachholidays.com have a wide range of Seine River Cruises holidays to fit any budget and taste. 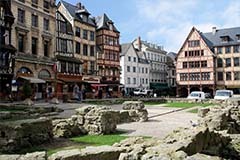 Rouen is a historic capital of Normandy. The timeless medieval city on the river Seine in the north of France. 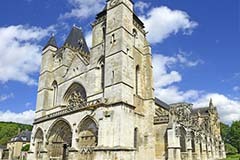 Famous historic sites are: the Gothic Cathedral of Rouen, the Joan of Arc square and the 16th-century astronomical clock. See the 14th-century courthouse where Joan of Arc was sentenced and also the nearby market square where Joan of Arc was martyred. 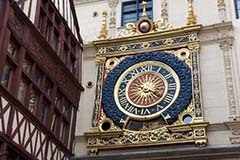 Gros Horloge is an renaissance clock tower with an astronomical clock dating back to the 16th century. 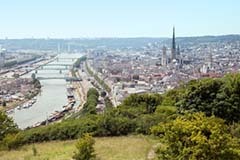 This landmark located on the right bank of the river Seine in the city of Rouen. 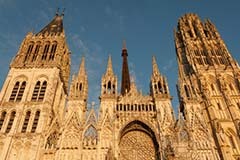 The Cathedral is the most prestigious historic monument of Rouen. This beautiful Gothic architecture is the tallest cathedral in France. Les Andelys is one of the most beautiful towns on the banks of the Seine. Great mixture of history, architecture, wonderful landscapes and inspirational atmosphere. 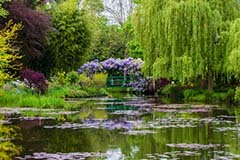 Monet's Gardens an extremely popular place to visit in spring. And September is the time when the Giverny Festival comes to town. The Chateau-Gaillard - the masterpiece of military architecture. 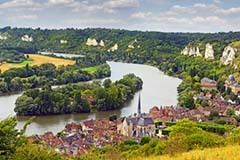 The ruins of the old fortress overlooks Les Andelys and one of the most beautiful meanders of the river Seine. The Church of Notre-Dame of Grand Andely always open for tourists. Admire its Gothic design, stained glass windows and oil based paintings. The Bridge of Alexander III - one of the most famous and attractive bridges that spans the Seine in Paris. The bridge honours the connection between France and Russia. 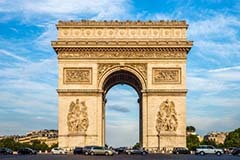 The Arch of Triumph - the most iconic of all French monuments. The monument stands in the centre of the Place Charles de Gaulle in honour of those who fought for France. 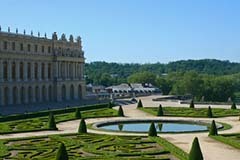 The Chateau de Versailles - the most ideal and elegant royal residence in Europe. The palace is a must-see destination for most tourists visiting Paris. The Eiffel Tower is 324 metres tall, you can use the lift to go up, or if you are fit enough, be ready for 704 steps to reach the 2nd floor.